Do you think this is just due to idling time while the ol' four-two warms up? I seem to recall thermo teaching me that engines run more efficient with a lower ambient temperature. I think that's the big reason, for sure. Idling cars burns more gas than most people know. It's easy to confirm yourself - drive a tank idling and record how many km you can drive to empty (or a half tank), drive your next tank turning off your ignition while parked and marvel at the difference. It kills me when people idle their cars, and not for the "green" reasons (which are still valid!) but for the fact that they're literally burning their money. On a chilly day a few weeks ago (maybe it was +8*C) I saw a massive truck idling at Sobeys while the owner went shopping. I lost a bit of faith in humanity. When it's -30*C, people can idle, I can't hold that against them. But even in the ultra-cold weather, I bundle up, let the engine warm up and the windows defrost and I take off. Some people I know let their cars warm up for 30 minutes. Another factor in my stats I think is highway driving. 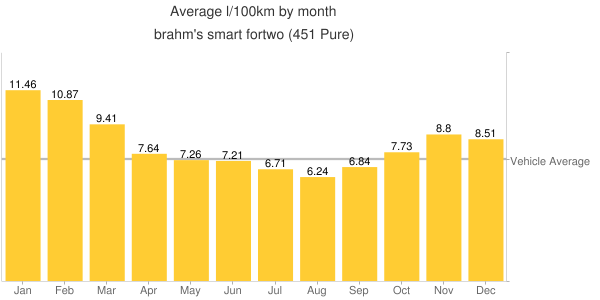 I do very little of it in the winter and tons in the summer (see: http://gas.brahm.ca/charts.php?vid=1#fueldistancemonth) so I think that influences those numbers a bit as well.